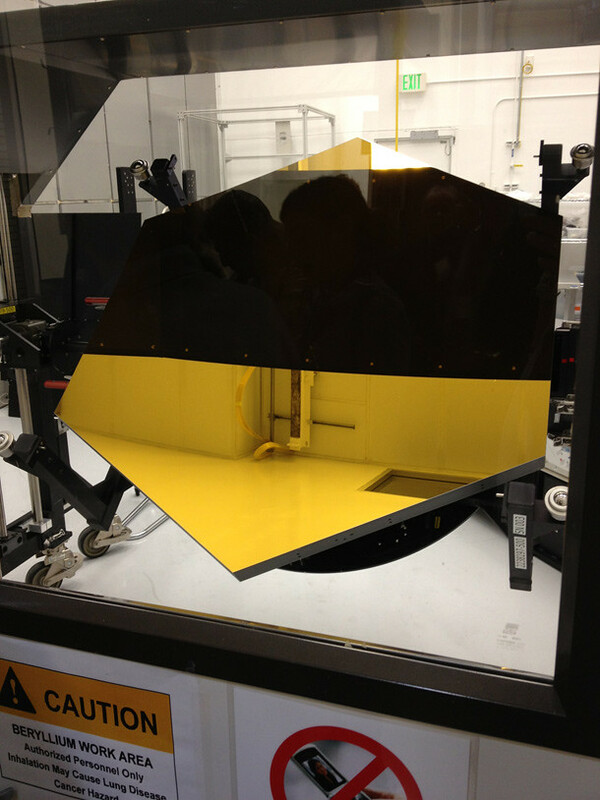 James Webb Space Telescope's primary mirror is ready to go! The James Webb Space Telescope – NASA’s successor to Hubble – recently reached a pretty big milestone: all of the segments of its primary mirror have completed construction, and are ready to be handed over to NASA. JWST isn’t your average ‘scope. Instead of a single, monolithic mirror, it will have 18 hexagonal segments that will fit together, working as a unit to focus infrared light from distant astronomical objects. Each segment is about 1.5 meters across, and will have actuators behind them (think of them as very accurately tunable pistons) to control exactly how the submirrors are aimed. 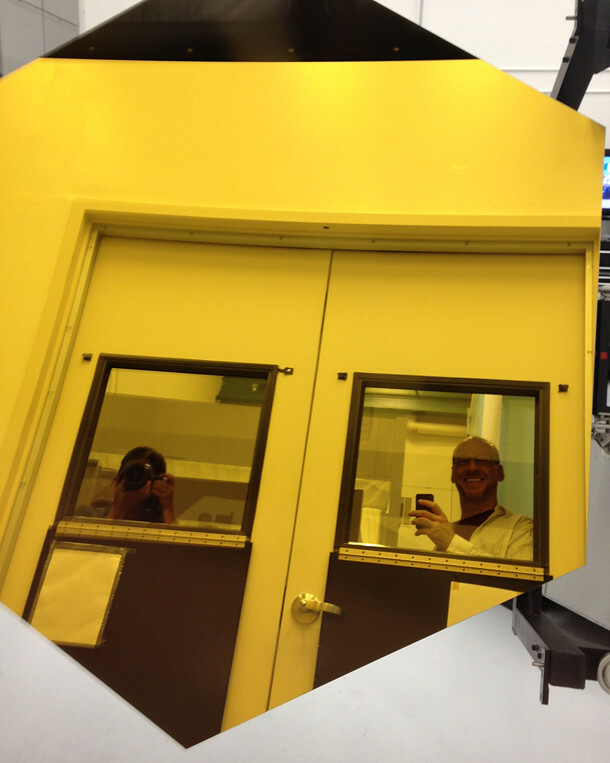 On the front, each mirror is coated in a very thin layer of gold, which is an excellent reflector of IR light. Looking a picture of a mirror can be difficult when you’re trying to see the mirror itself. Here’s another shot that makes it more obvious. The mirrors is tilted up, and the dark band running through it is the reflection of the top of the stand it’s mounted in. Their mirror itself is the gold hexagon. I got a good look at it, and it’s no small thing for me to say its the cleanest mirror I’ve ever seen. I’ve been around a few ‘scopes in my time and their mirrors always have some schmutz on them. This had none. The figure of each mirror (the technical term for the shape of the surface) is incredibly accurate: the bumps in the surface are on average smaller than 25 nanometers. A nanometer is a billionth of a meter… to give you an idea of how small this is, a typical human hair is 400 times thicker than the deformities in the mirror. As one person mentioned to me while we were gawking at the facilities, if a bacterium fell on the surface, it would far and away be the biggest thing on the mirror. So yeah, these things are smooooth. The mirrors need to be this smooth to accurately reflect light. Any nonconformity would scatter light a little bit, messing up the telescope’s resolution. 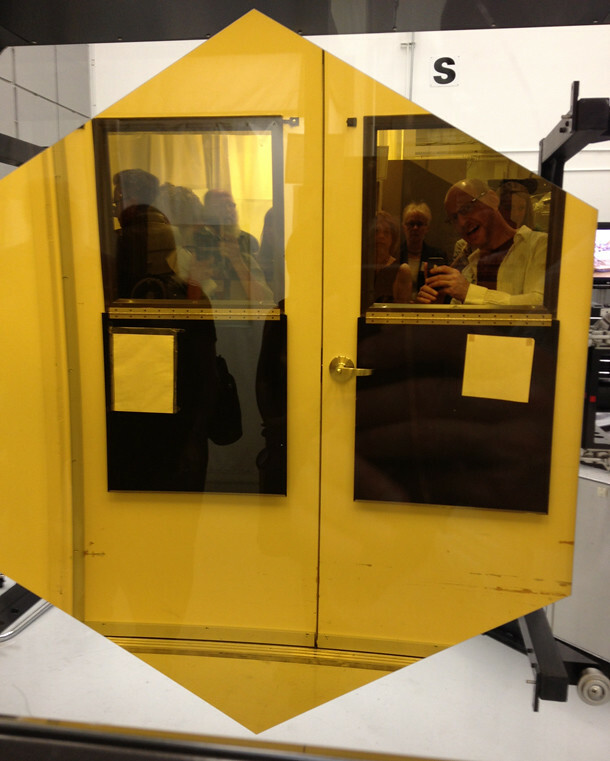 I’ll add that mirrors like this – the size they are, made of beryllium, figured to this accuracy – have never been accomplished before. And that’s only part of it, since of course all 18 mirrors must act as one once JWST is in orbit. As you can see, there’s an inner ring of hexagonal mirror segments and another ring outside those. 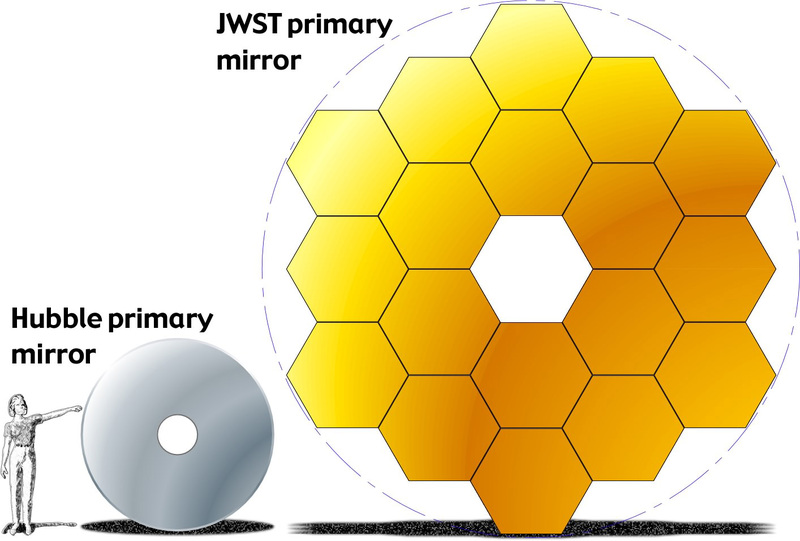 Each individual mirror will focus light into another mirror, called the secondary, that will be mounted in front of them (I have pictures and video of a full-scale model of JWST that’ll help you see this). That will in turn reflect the light into a third mirror, which will then send the light from distant stars and galaxies into one of four main cameras. And from there, we’ll learn a lot about how the Universe works. To give you an idea of how big this assembly is, I’ve inset a diagram comparing JWST’s mirror size to Hubble’s. Hubble’s mirror is 2.4 meters across – about 8 feet. 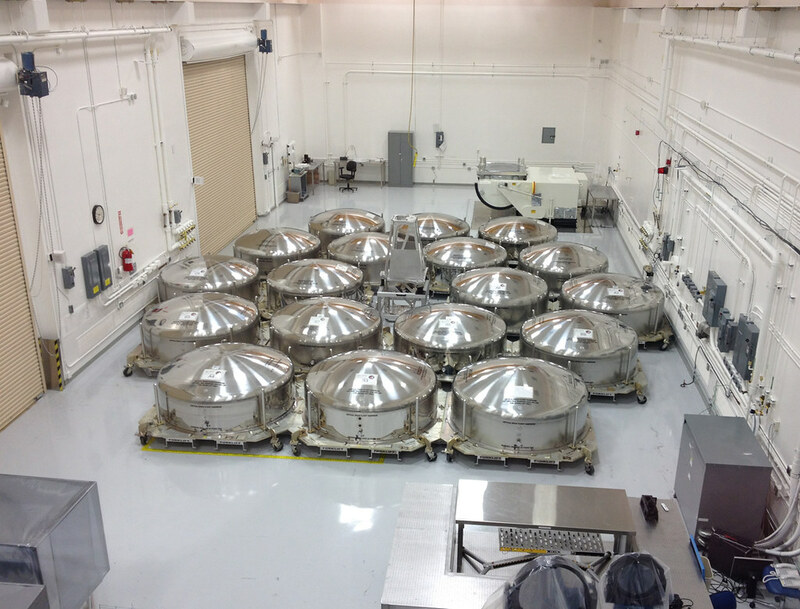 JWST’s mirror will be over 6 meters across – about 20 feet. It will be able to collect far more light than Hubble, and see fainter objects. I’ve written quite a bit about JWST recent times. My opinions are conflicted (see here and here, and most recently here), but hopefully clear: I think this is a worthy project to do, but it has been plagued with cost overruns and is way behind schedule. It was originally supposed to launch in 2009 and cost less than a billion dollars; now it will launch no sooner than 2018 and the cost is estimated at $8 billion. This has put a huge amount of strain on NASA and other missions, both economically and politically. That money had to come from somewhere, so other missions have suffered to sustain JWST. I’m hoping that most of that is behind us now. NASA is supporting the telescope, and Congress has given them enough money, hopefully, to complete it. I’ll note that Hubble itself had a history very similar to this: over budget, behind schedule, putting huge strains on relationships in the astronomical community. And now, of course, when people think of Hubble it’s with admiration – deservedly – for what it’s accomplished. That may yet happen with JWST as well. Once it’s up and running, we’ll move on and see what a magnificent machine it is. But I also hope very much that NASA, Congress, and the astronomical community have learned the lesson of their big observatories. These missions need tighter and more realistic management if they are to be built within reasonable parameters, and not deleteriously affect other important missions. It’s something… we should all reflect on.